WELCOME TO LINGUAKIDS, a place to learn and have fun at the same time! LINGUAKIDS is a company specialized in teaching young children Foreign Languages in a fun way. We have launched a series of new programs in FRENCH, SPANISH, KOREAN and other languages to help us get closer to our young learners and to serve them better. This website will act as a platform for us to share all our details regarding our offerings and also help parents quickly get in touch with us for all their Foreign Language needs. In this website you will find detailed information about all the Foreign Language services that we offer; you will also find other useful information such as contact details, calendars, lessons locations, our programs and our photo gallery. We have also shared our vision & mission statements and our quality initiatives that are making us a better organization. The summer camps are an important miles stone for kids learning a foreign language. It is indeed a unique opportunity to be immersed for several days in a foreign language atmosphere. That’s why we are offering summer camps from end of June till end August. Having classes every day of the week in French, Spanish or Italian is a good way to improve knowledge in a foreign language. You choose the week and we do the rest. For the younger ones age 6 months and up – a 45 min class “Mommy and Me”. This interactive musical curriculum teaches children numbers, colors, shapes, greetings, animals, body parts, etc. through songs, dance, and movement. Children must attend this class with a parent or care-giver but drop off is available on a case by case basis. For kids age 2 and up – a 2 hour class “Immersion package”. Every day a 2 hour immersion program. Free from curriculum and includes bingo games, hopscotch, twister, art and craft and many other games. Interactive musical program, art, motor skill enhancement activities, snack, theater, expression, Latino or French dances, and culture. 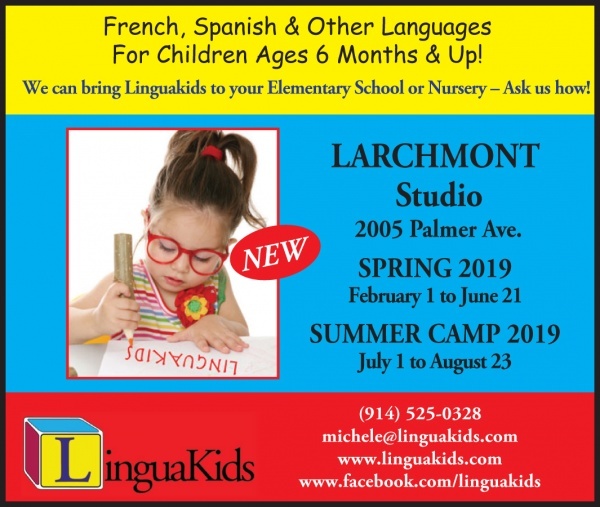 Our summer classes in Larchmont is a unique opportunity to improve children’s language skills. Choose the week and we will do the rest. Please go to the registration page for planning details and registration. LinguaKids® offers French and Spanish classes for children starting at 6 months old. LinguaKids®’ teachers are friendly, energetic, native speakers who completely immerse children in language and culture. Children are engaged in a multi-sensory approach, combining songs, movement, arts and crafts, games, storytelling, and role-playing. Camp classes start in June. Contact Me About LinguaKids®, L.L.C. Read More About LinguaKids®, L.L.C.